Sensors has introduced S-AGM Plus. 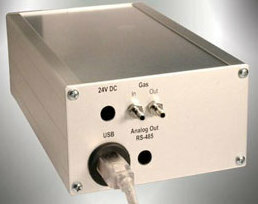 The S-AGM Plus series is an updated version of the Advanced Gasmitter manufactured by Sensors. It offers optimized accuracy and readability for gas measurement. Its linearized output signal provides a better signal to noise ratio, while its standard temperature and pressure compensation reduces drift. Reliable outputs are ensured through its internal conditioning. It is equipped with an NDIR-dual wavelength sensor for gas measurement, and a web-based communication software. This device has low-grade drift characteristics, with a response time of <6s, and 2mA to 22mA output display measurement range deviation. S-AGM Plus also has an enhanced USB, and RS-485 interface. For more information, visit Sensors website.